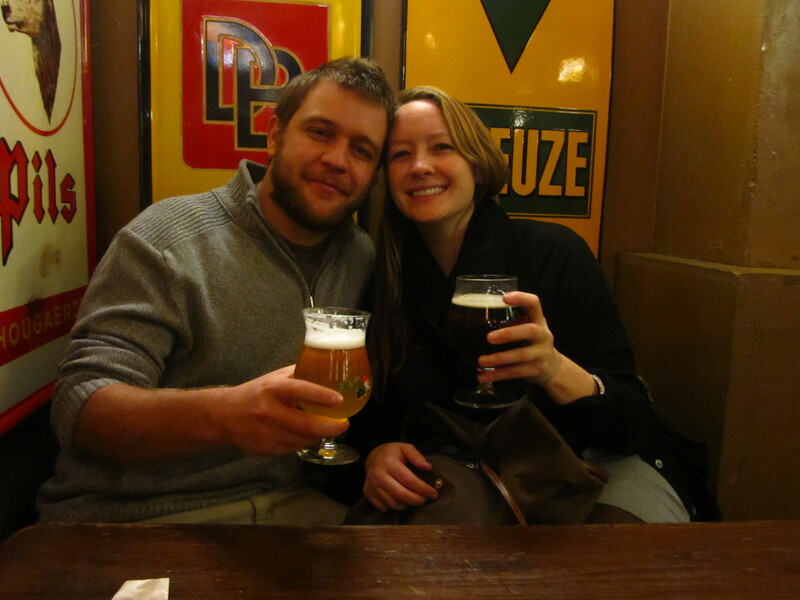 Dave and I returned to Berlin last night after a wonderful Thanksgiving trip to Brussels, Brugge and Amsterdam. We had an amazing time and have so much to be thankful for! The week started out on a great note last Sunday when I got a cryptic Facebook message from Jackie letting me know that Tamara, Jill, Matt and her were headed to Berlin Monday morning. Considering they all planned to stay and get jobs in Prague I was a bit surprised. Turns out they opted for a totally different route and are going to spend the next month travelling around Europe before heading to Taiwan together in the new year! 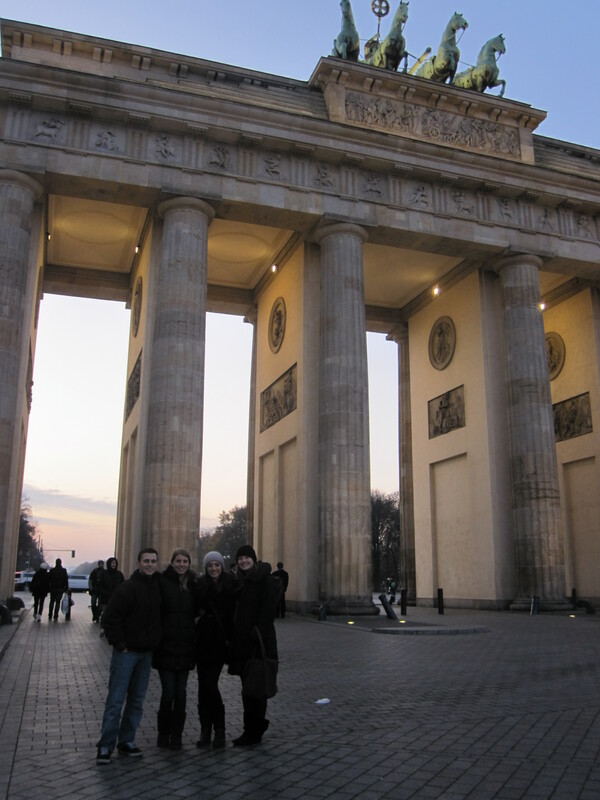 We were happy to host the crew for a few days while they explored Berlin and are looking forward to seeing pictures and hearing about all their future travels. Everyone departed our place Wednesday morning due to the fact that I was flying out to Brussels that afternoon. Luckily it’s pretty simple to get to Schoenefeld airport via S-Bahn and my flight with EasyJet over to Brussels went smoothly. Unfortunately, it’s a bit more complicated on the Brussels side. First of all- the Brussels International Airport is HUGE! I seriously walked for 20 minutes just to get out of my terminal. From the airport I had to take a commuter train about 20+ minutes into the city, then get on the metro, then the bus. Maddie gave me great directions- so I never got lost, but it took almost 2 hours for me to reach her apartment. Needless to say- I was tired and hungry by the time I arrived! It was so great to see Maddie though and to meet all her awesome roommates. 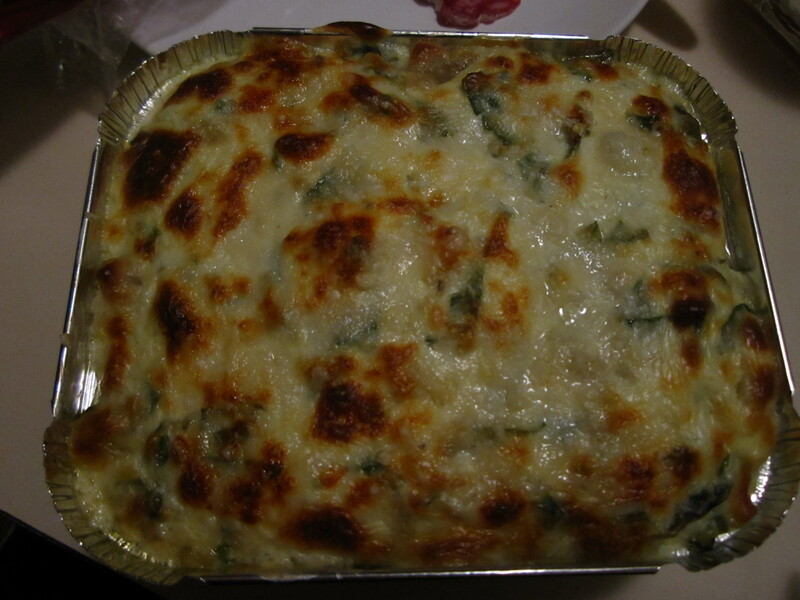 She was preparing dinner when I got there and we enjoyed homemade spinach & artichoke dip and a big spinach, feta, walnut and pear salad- delicious! 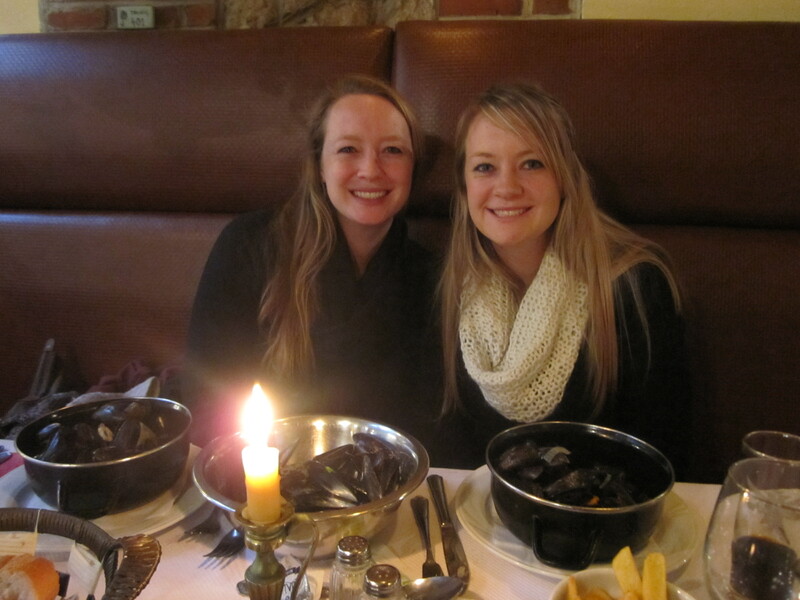 Her roommate Chrissy had also cooked up some Oreo Truffles- which were to die for…wonderful welcome into Brussels! The next day Maddie took me to her favorite sandwich shop before walking me up to see her school. 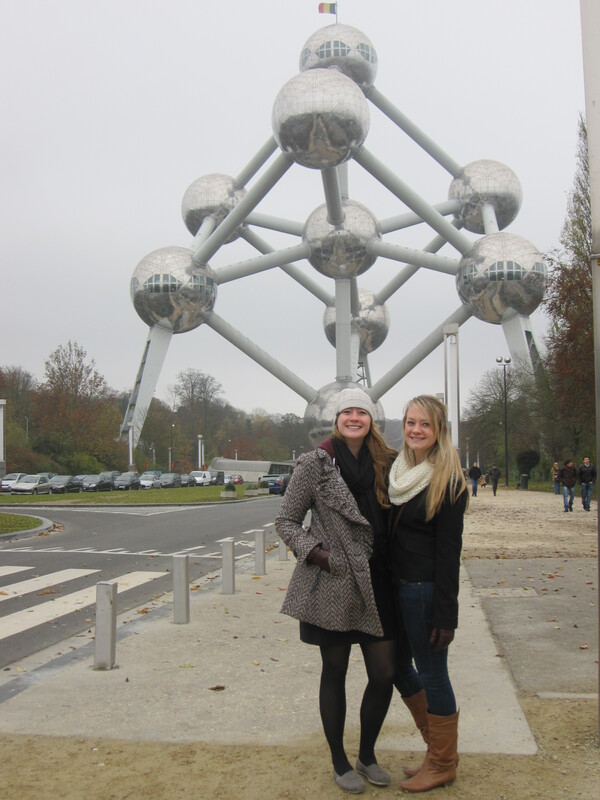 I left her at school for her two Thursday classes and ventured into Brussels on my own. I spent a few hours wandering around and taking in some sights before heading back to Maddie’s place to get ready for Thanksgiving dinner! Her program (ISA) hosted a big potluck dinner at the restaurant located directly under their office. All the traditional favorites were there including a turkey, mashed potatoes, stuffing (which we made), sweet potatoes, gravy, cornbread etc…The one snafu was that Dave was suppose to get to Maddie’s place around 8:00, but come 8:30 I still hadn’t heard from him. I tried calling and texting, but to no avail. I was getting pretty worried when someone reminded me that in Europe you have to enter a pin to access your phone every time you turn it off and on and that he probably forgot it. I was worried that he might have gotten frustrated waiting and would try to wander away from Maddie’s apartment- so I hustled back there to find him waiting on the corner! I was so happy to see him and we were able to make it back to the restaurant in time to catch dessert. The kitchen crew was even able to scrounge up a plate of “left overs” for Dave- so he got to enjoy some turkey and mashed potatoes as well as dessert! All in all a wonderful ending to my absolute favorite holiday! The next day we were up early- ready for Maddie to show us her city! 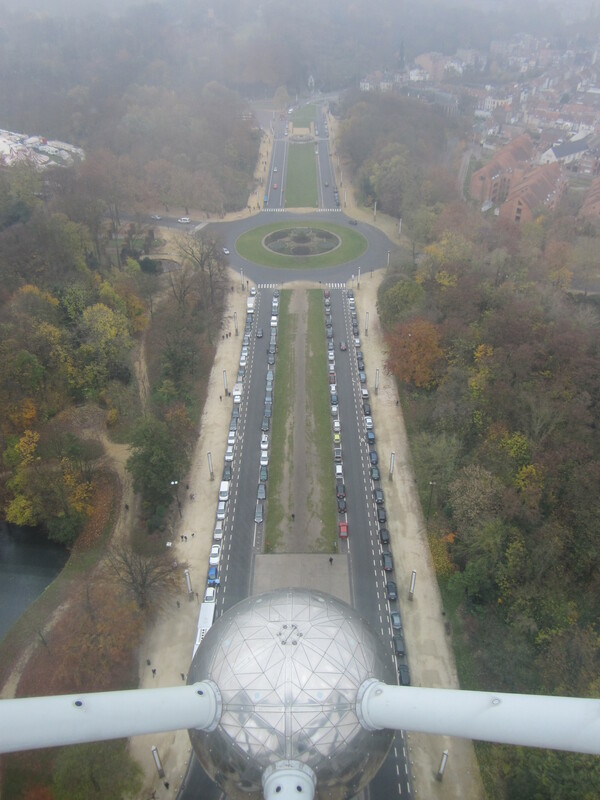 We first headed a little out of the center to the Atomium. It’s a massive steel monument originally built for the 1958 World’s Fair. Besides the fact that it’s a beautiful structure, one of the most exciting things about seeing it was that my grandparents were in Brussels for the fair that year. My Grandpa Herlache was stationed in southern Germany and they did a good bit of travelling around Europe during their 2-year stay. In fact- one of my most prized possession is the charm bracelet my Grandma Herlache gave me a few years back. She collected charms from each of the different cities they visited on their travels and the Bruxelles charms was always one of my favorites. It was pretty cool to be there for a variety of reasons. We paid to go up and into the structure and it was definitely worth it. Even though it was overcast the views were amazing and there was a really interesting exhibit on immigration. 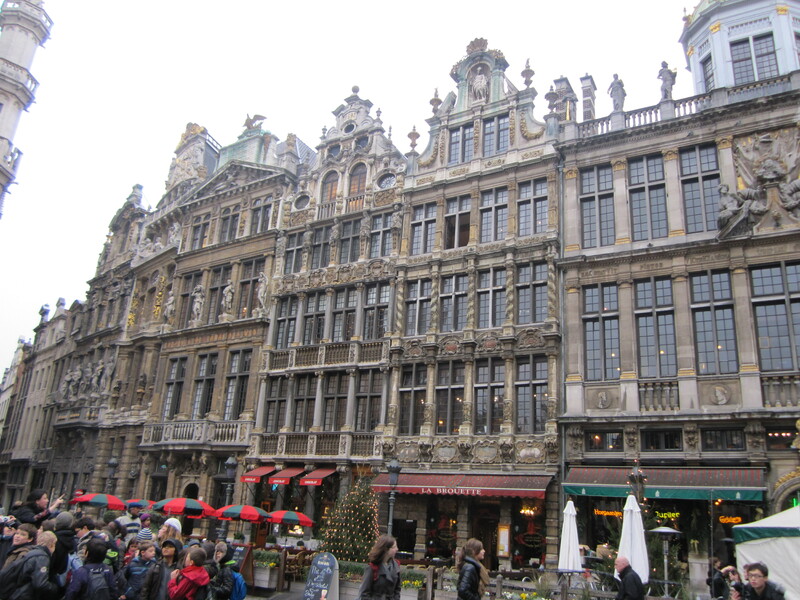 If you’re travelling to Brussels I highly recommend it! After the Atomium we headed back into the city. We dinned on the famous Belgian moules frites for lunch and followed lunch up with a waffle (and speculoos ice cream) from the Australian Ice Cream’s stand. 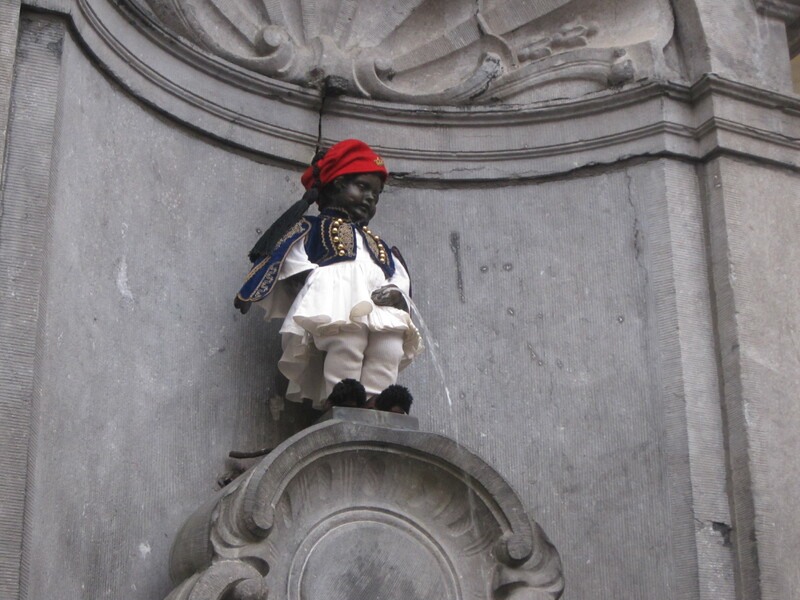 We then proceed to walk around the city- heading to the Grand-Palace, Manneken Pis, Jeanneke Pis and some of the other beautiful sites. It was pretty cold out so we opted to warm up at home for a few hours before heading out to Delirium at night. 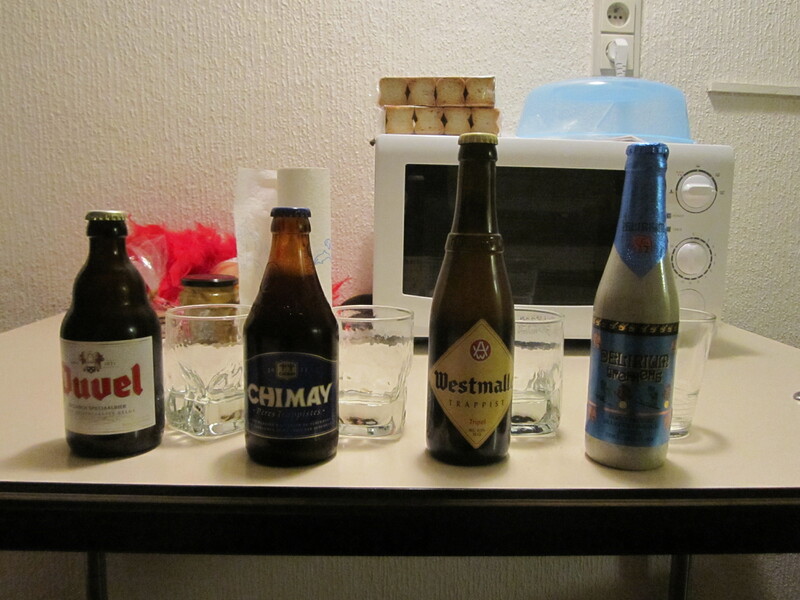 We stopped at the store to pick up a few beers though and we conducted our own Belgium beer taste test. We took turns being blindfolded and sampling the different beers trying to 1. Guess which beer was which and 2. Pick our favorite. 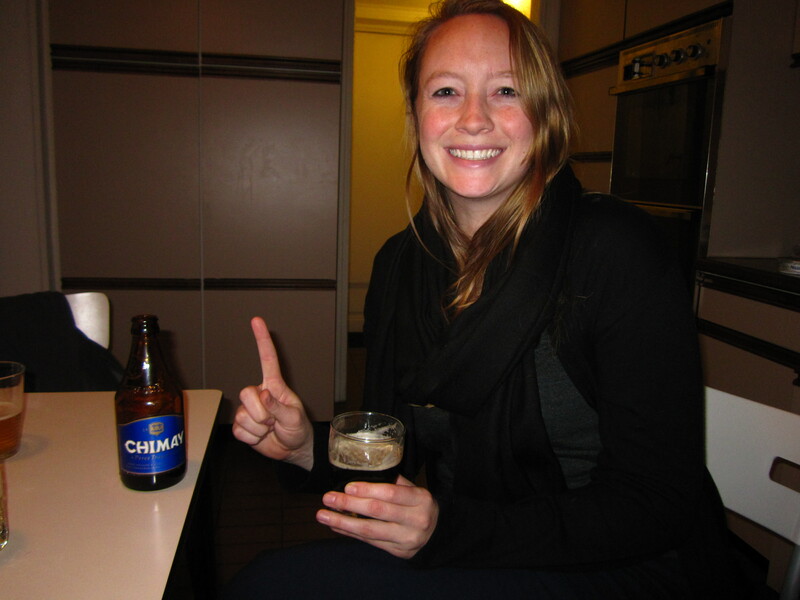 Dave’s pick was for the Westmalle, I liked the Chimay and though Maddie refused to pick just one, but I think she liked Delirium. 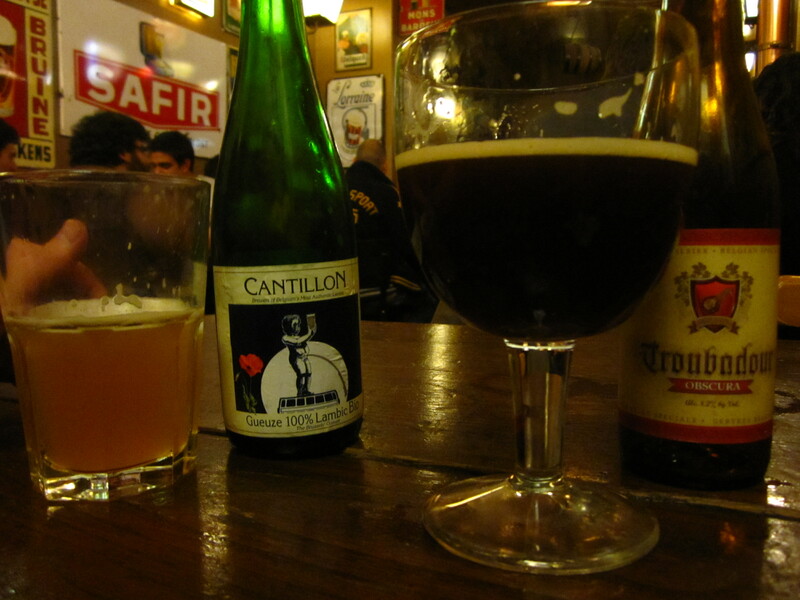 On the whole Belgian beers are pretty strong- so even with the 3 of us sharing we had a good buzz going after finishing up the taste test. After the taste test, more food (I love that Belgium seems to be all about the food and drink!) and a few rounds of beer pong we headed downtown to the Delirium Cafe. The Cafe has an enormous selection of beer. They probably have between 30-50 beers on tap and then a phone book size menu of the other 2000 varieties! Luckily we did a little research beforehand are were prepared to select our beers and were able to fight off the crowds for a table. 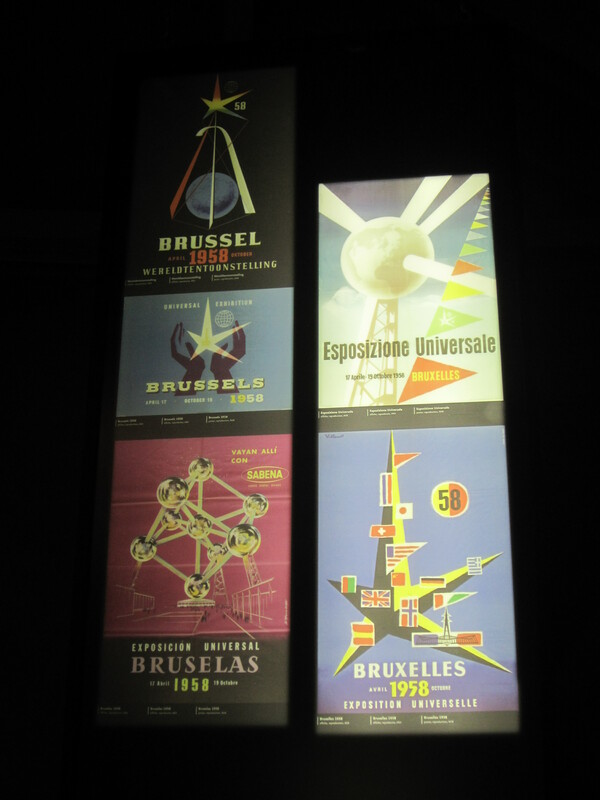 It was such a fun experience and again something I highly recommend to any future Brussels visitors! The next morning we sadly said good bye to Maddie (well not so sadly- she is visiting us in Berlin this weekend!) 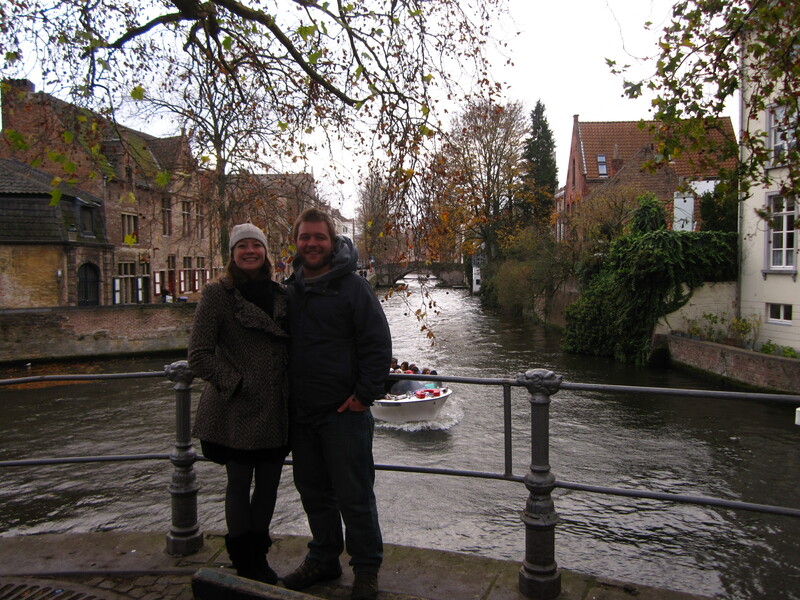 who headed off to Delft for an ISA trip while Dave and I hopped a train to Brugge. 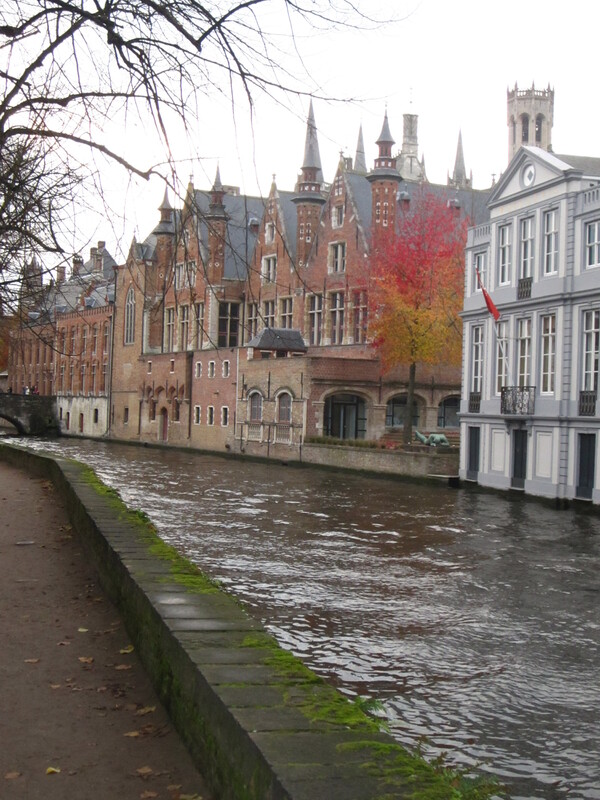 Brugge is an absolutely beautiful little Flemish city in western Belgium. There were tons and tons of tourists out and about and we joined them- walking through the city center, down the beautiful canals and streets and again just taking in the sites. 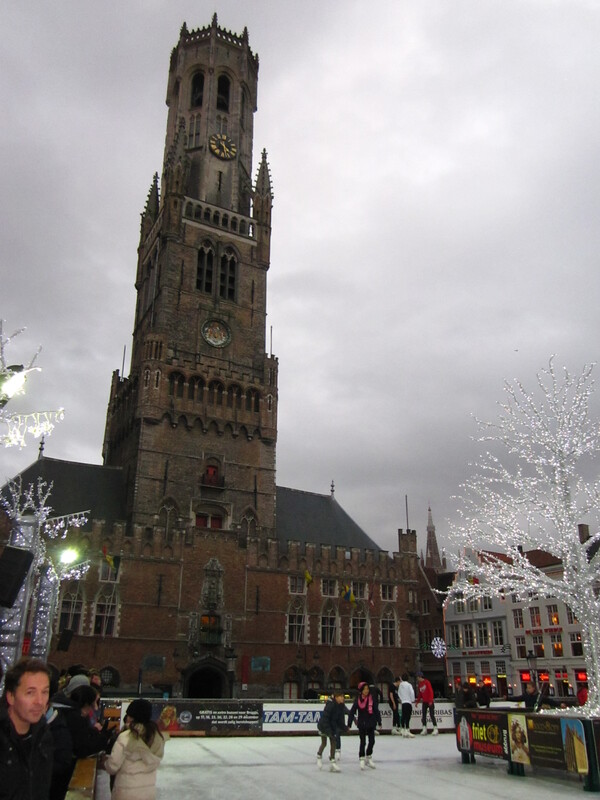 We thought about walking up to the top of the Belfry, but the line was long and you had to pay 8 Euros/person to climb the 366 steps. We opted for the view from the street. After about 3 hours of walking around we stopped in a cute little cafe for some hot cocoa and cookies. We got lucky with a window seat and had an enjoyable time people-watching as the sun set. After a quick nap back at our hotel (Hotel Etap by the way was fantastic- clean, affordable and a great location!) we went out into the city to see it at night and to grab some dinner. We walked around for awhile before deciding on an Asian-inspired restaurant. 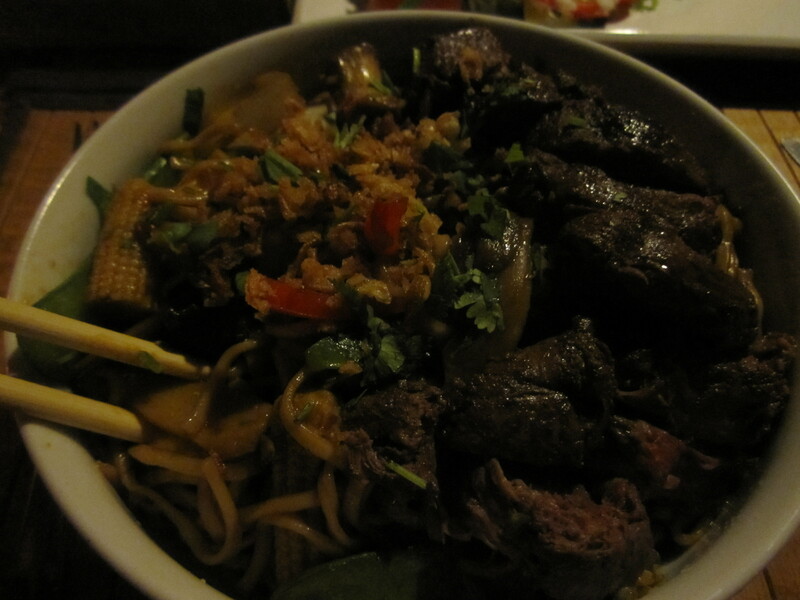 I had the red curry and Dave, being adventurous, got a Wok-Bowl with Antelope meat! It was gamey, but really good! A perfect ending to our day in Brugge. Sunday morning we woke up early to head to our last stop: Amsterdam. The hotel was an easy walk to train station and we made it in time to catch the 9:04 train to Antwerp. From Antwerp we then transferred trains to Amsterdam. Though we only had a half-hour delay in Antwerp we took it upon ourselves to see at least a little of the city. The train station was very centrally located and we were able to get great views of the beautiful station, the main town square and the zoo. After our little layover we got back on the train for the 2 hour ride to Amsterdam. 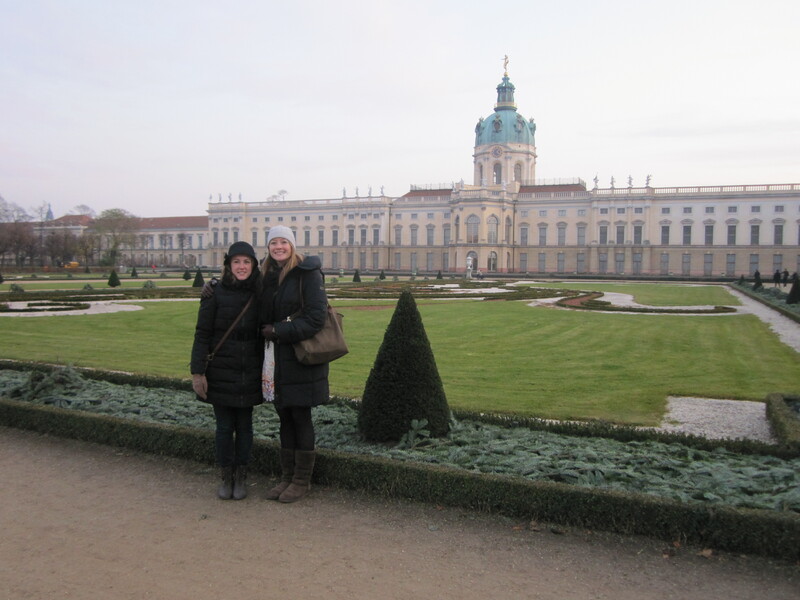 When we got into the city we had a little trouble navigating the transportation system, but a nice man helped us with some directions and we found our B&B pretty easily. 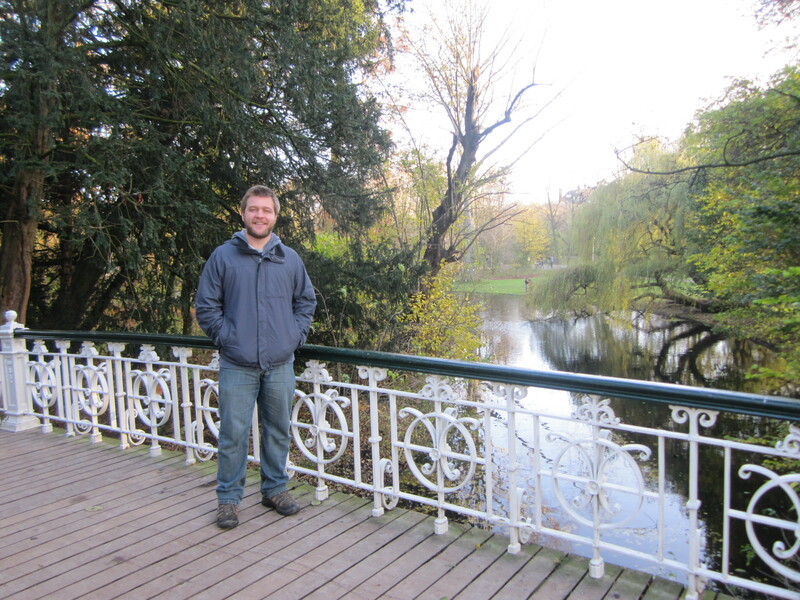 We stayed a little outside the city (near the south end of Vondelpark) and were very happy about our decision to do so. 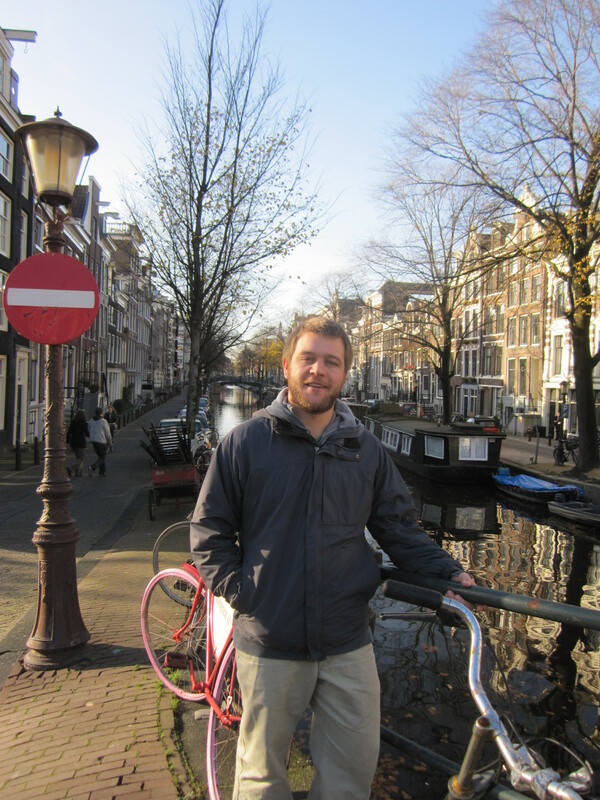 Let me preface by saying Dave loved Amsterdam when he visited in college- I didn’t. I stayed in a horribly dirty hostel in the center of the city called the Flying Pig (the electricity in our room didn’t work, the linens looked unclean and the shower from the floor above leaked into our bathroom). 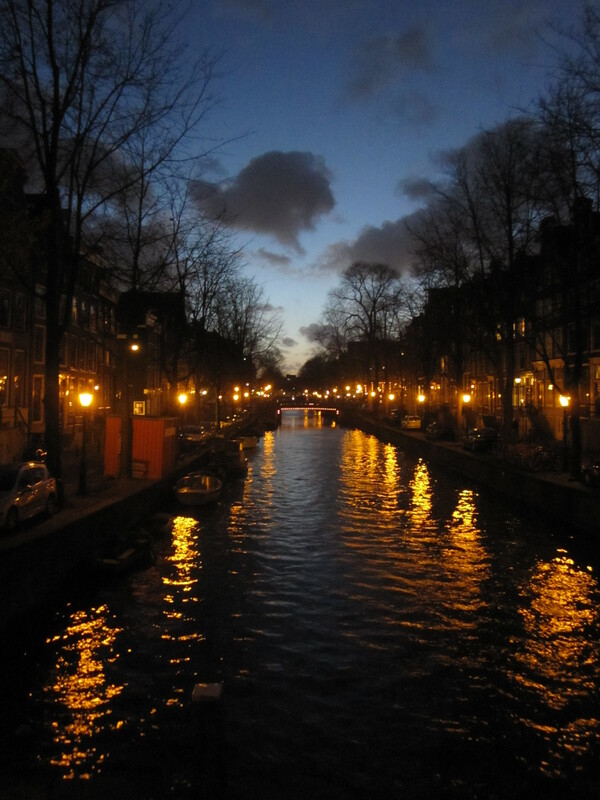 Also, though Amsterdam is a beautiful city with a rich history I think that the Red Light District and Coffee Shops can attract a seedier crowd. That crowd in turn affects the opinions locals have of tourists- essentially I ran into some pretty rude people when I traveled in Amsterdam with friends in 2005. 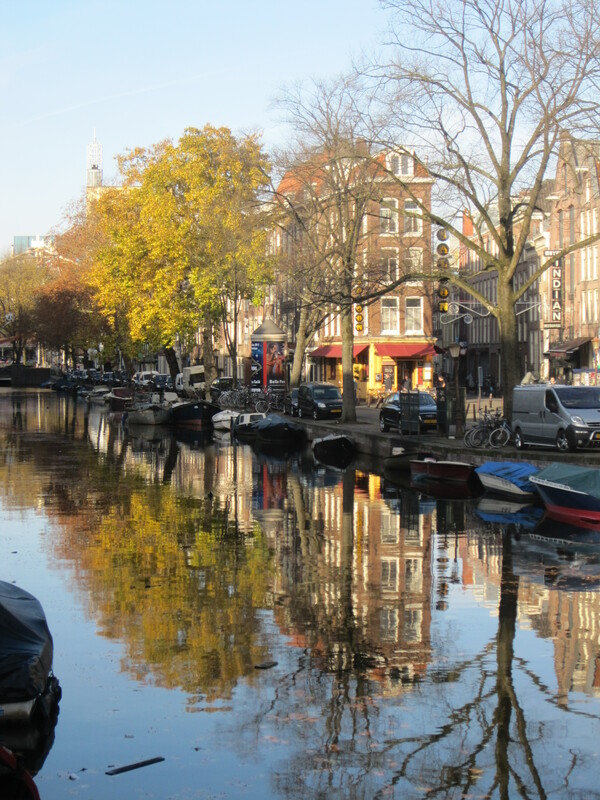 I’m happy to say though that after our short visit this weekend my opinion of Amsterdam has certainly changed and for the better! To start with- the B&B we chose was fantastic. It was on a quiet street a little outside the city center (about a 20 minute walk to museum district) and it was run by a wonderful lady named Sara. 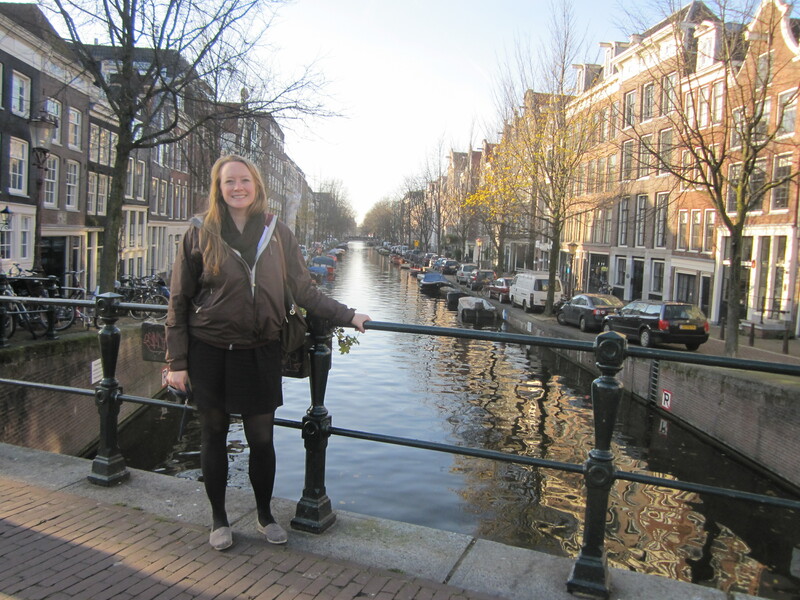 Sara is Dutch, but has lived all over the world and had so many interesting stories to tell. For example: she spent one summer in the ’60s travelling around Europe in a VW Bug with 4 other girls before she moved to Rome and worked as an extra in film. Her B&B is only open for the rest of the year though because in February she is moving to Curaçao. In addition to being so interesting she was also so hospitable and helpful. After checking in with her and dropping our bags off we headed out to explore Vondelpark. Since it was Sunday afternoon there were a good number of families out on walks or biking around. Even though it was cold we spied a few people out at an outdoor restaurant and a few other picnicking. After spending some time in the park we walked up into the museum district and then into the city center. Again, we spent most of our time just strolling around and trying to see as much of the city as possible. We spent about 6 hours walking around before heading home to turn in for the night. On Monday (the last day of our trip) we woke up to a fantastic breakfast of omelets and croissants prepared by Sara. She also blended up her own fresh orange juice and strawberry/pineapple/bannana juice for us. We were feeling refreshed and ready to go after the meal. 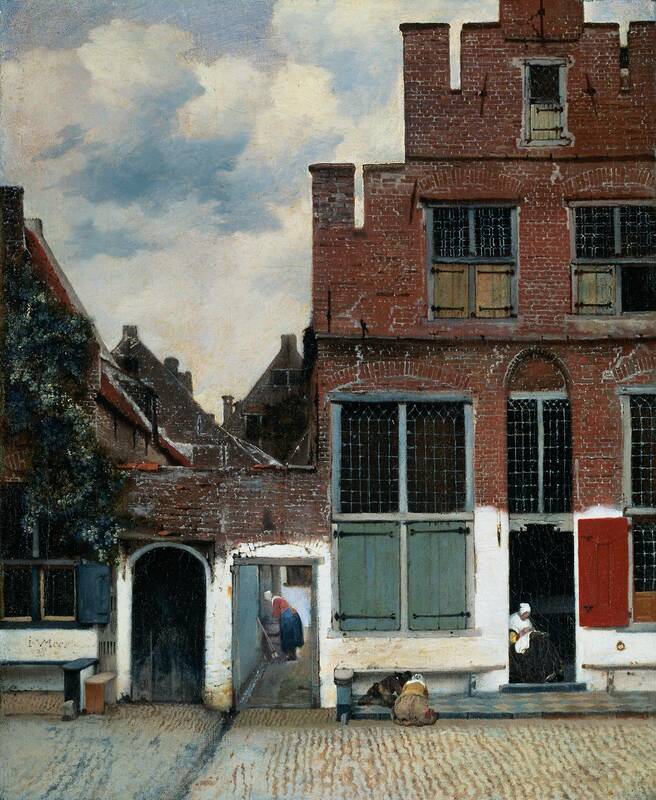 We took the tram up to Rijksmusuem. Though the museum is undergoing major renovations they still have one big wing open with a variety of different pieces. We learned a bit more about Dutch history (we agreed that the Dutch were a little crazy) and saw some pieces of antiquity. Then we made our way to the painting/sculpture gallery in which we saw Andy Warhol’s portrait of Queen Beatrix plus a number of Veermeer’s and Rembrant’s including The Night Watch. 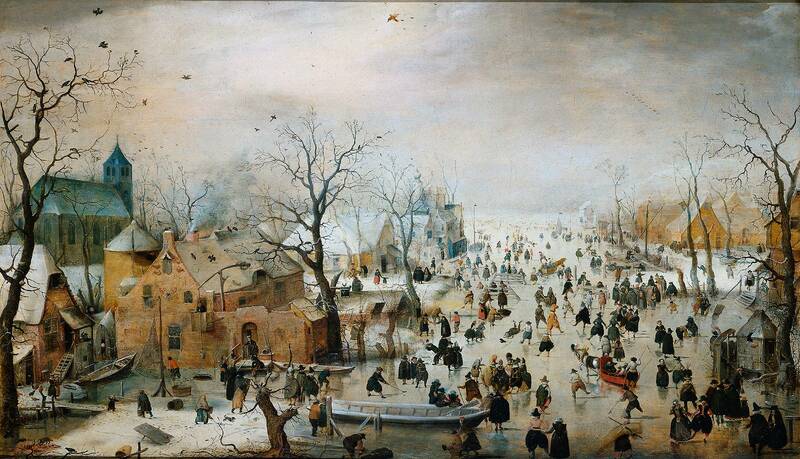 My favorite was Veermer’s The Little Street and Dave thought Hendrick Avercamp’s Winterlandschap met Schaatsers was particularly entertaining (maybe because of the man urinating in the snow in the center of the scene?). 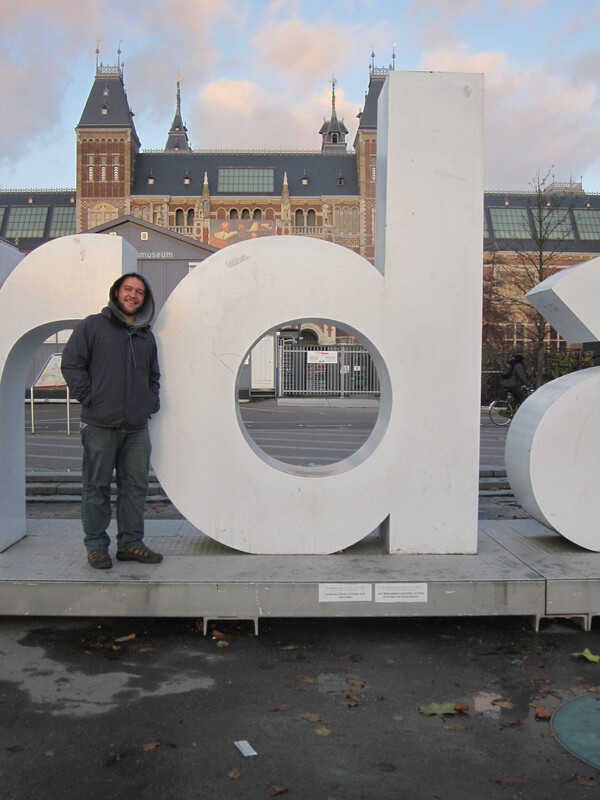 We spent about 2-hours in the Rijksmuseum then headed over to see Anne Frank’s house and wander through the canals in the daylight. We stopped at a market for lunch and picked up some brie, salami, bread and beer and then wandered back to Vondelpark to enjoy. 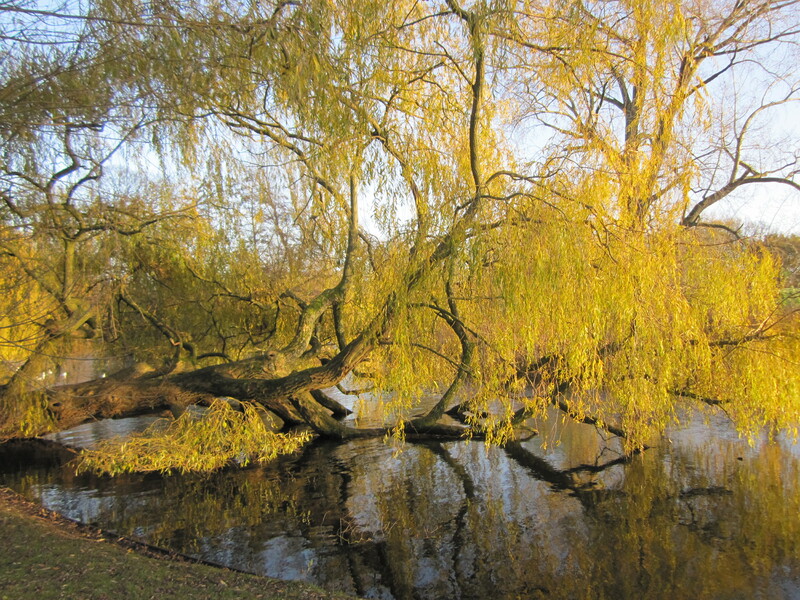 Though it was cold the sun was shining and it was nice to enjoy a little picnic in such a pretty place. Post lunch we had just a few hours left until we needed to head to the airport. We took the tram up to the city center and wandered through an open market and then the Blumen’ market (flower market). I though about buying some tulip bulbs or seeds, but was wary about how long they’d last. We also were able to sample some Dutch cheese (something I didn’t know they took such pride in) and see the last little bit of Amsterdam. As we headed to the airport we were sad that the trip was over, but looking forward to a few days of rest and relaxation (well however much rest and relaxation you can get with classes and job search to get done). Our feet were in much need of a rest and it felt good to be back “home” again. If you made it this far in the post I apologize for its length- just so much to see and so many pictures to post! 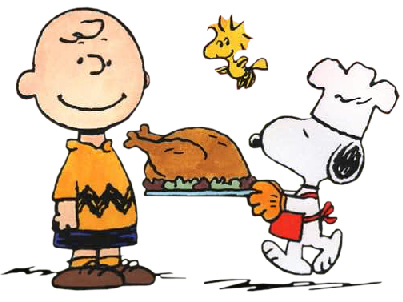 We hope everyone had a fantastic Thanksgiving with lots of food and family. We have so much to be thankful for- our amazing, supportive families and friends, the opportunity we have to travel and of course each other. Thank you to all who read our blog and we hope you think about coming to visit us soon! Last night the international office at HWR (Dave’s school) had an outing to the Berliner-Schultheiss Brewery. Tickets were a bit steep at 10€ a piece, but it ended up being completely worth it! The night started a little precariously- it took close to an hour and a half to reach the Brewery via public transit and everyone was ready to get started when we arrived. They began the tour with a short film about the history of the Brewery and then we walked throughout the plant looking at the brewing tanks, storage systems and finally bottling plant. Our guide was a master brewer himself and knew his stuff! I asked him what his favorite beer was and he said there was no way he could ever choose, but he knew that German beer is far superior to other beer. He asked where Dave and I were from and when we said we’d been living in Boston he made mention of Harpoon and their famous IPA. We were surprised and excited that he knew about Harpoon, he probably thought it a little ridiculous how excited we were, but oh well. Tasting followed the tour portion of the outing. I’ve been to my fare share of brewery tours and typically tastings get you just a couple beers or maybe a pitcher or so to share- not in Berlin. We were led to a warm, beautifully lit room in a historically preserved buildling (basically it was one of the only things left standing in Berlin post WWII) with 6 delicious beers on tap and another array in bottles. 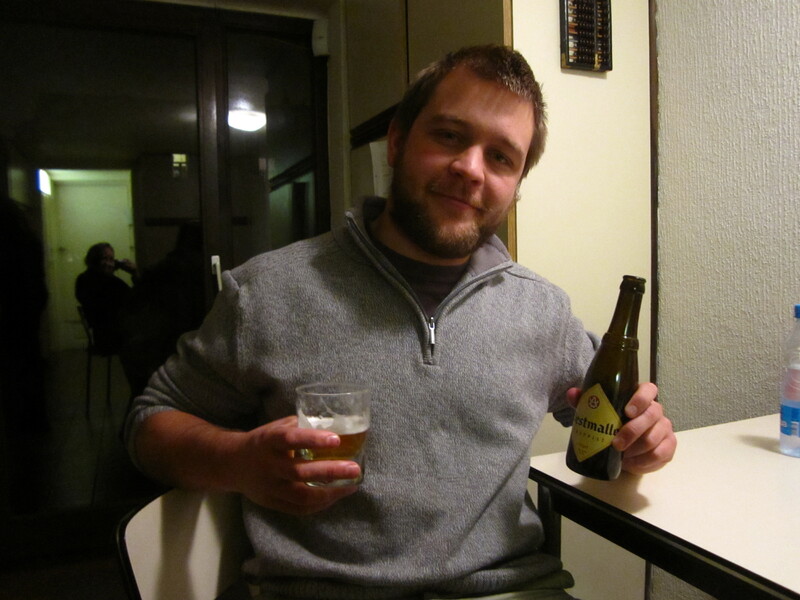 We were told we had an hour and a half to drink as we pleased- UNLIMITED BEER for 1.5 hours! Of the 25 or so of us in the group probably 20 of the students were undergraduates studying abroad- needless to say people got pretty drunk. I tried to contain myself, but did end up having 6. I think Dave beat me by 1 with 7. The Bock and the Markischer Landmann were my favorites and Dave liked the Schultheiss best, but all were delicious! It’s Monday, November 14th, and I am back in Berlin. It was with bittersweet feelings that I caught the train from Prague here yesterday afternoon. On the one hand, I’m thrilled to be back with Dave and get to see him everyday. I really love our flat in Berlin and am looking forward to all the wonderful Christmas festivals and traditions the Germans are so famous for. On the other hand however, I had an absolutely fabulous time in Prague. I met some amazing people, learned so much through the TEFL course and loved getting to live in my favorite European city again. Luckily Prague is only a 5-hour train ride away and now I have 20 amazing friends all over the world that I can plan to visit in the future! 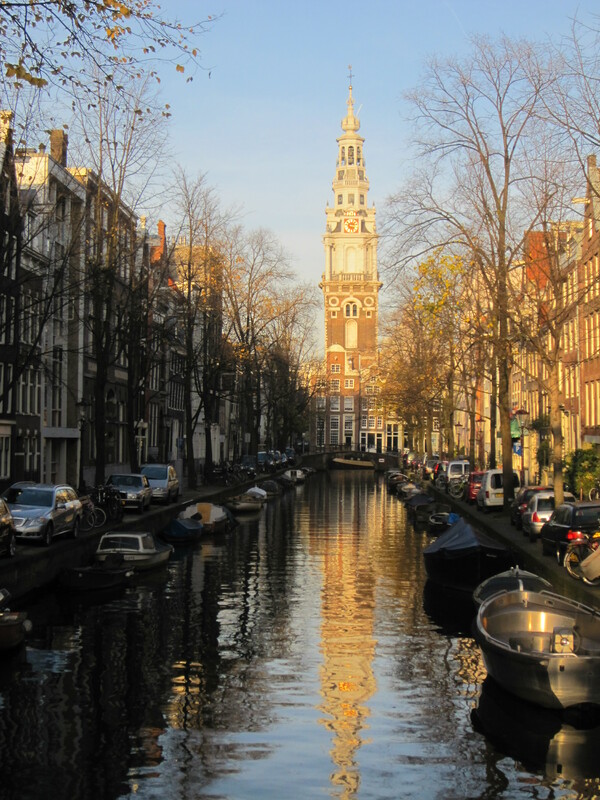 Dave and I are also in the process of planning our first Euro-trip together (we’ll be visiting Brussels, Bruges and Amsterdam at the end of the month)…so some great things to look forward to! 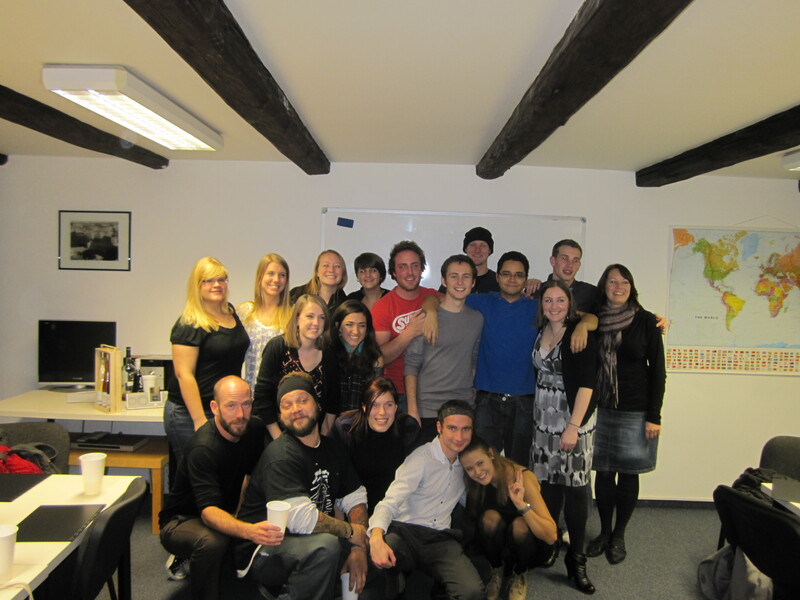 I think the last post I wrote about my time in Prague was about teaching. As the last weeks of the course progressed teaching was on the forefront of everything. In addition to the usually twice-weekly teaching sessions we were also required to complete two grammar sessions for our classmates. And while I think I can admit that my grammar has improved these last 4-weeks, it’s still pretty abysmal. So though these lessons were shorter in length they took just as long to prepare for. And on top of all of the teaching we had a grammar test to prepare for on the last Thursday of the course. Needless to say it was a pretty packed last couple of weeks. Fortunately everyone in our group passed the course (apparently there is typically a 5% failure rate) and we got to celebrate our achievements together with a graduation/champagne toast on Friday night. While we did spend a great deal of time working we also got in a bit of fun as well. I’m pretty sure everyone was nocturnal the 3rd weekend in Prague. On Friday night we started a club called the Roxy before moving to two other venues. We left the last club just after 5:00am allowing us to catch the metro home (which closes from 12:00-5:00) instead of waiting for the tram. Because of the late hour of our departure we didn’t make it up until close to 3:00 in the afternoon. We spent the evening “eating breakfast” at Bohemia Bagel and then doing a little shopping downtown. Since it was our last “full weekend” together in the city we decided we had to go out again. 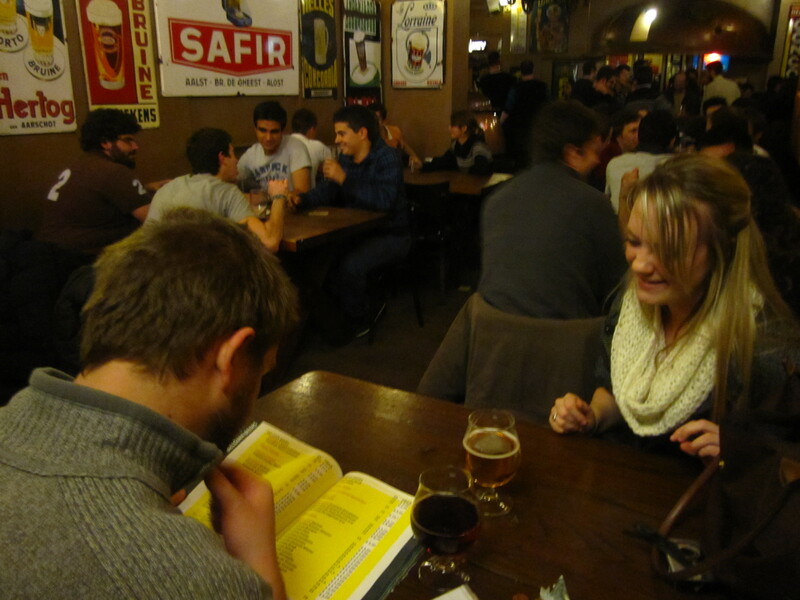 We started at the oft frequented beer hall before it was decided that we had to try out Karlovy Lazne at some point on the trip. I’d been before and wasn’t too keen on paying 150 korunas to go again (it’s a little overrated), but someone found us coupons and we were able to get in at a discounted rate. It was packed as usual, but also a lot of fun. For those of you unfamiliar with Karlovy Lazne it’s a 5-story club that claims to be “The Biggest Music Club in Central Europe”. Every floor plays a different type of music and it’s always slammed with tourists. We spent most of the night on the “oldies” level, which essentially played Michael Jackson’s greatest hits on repeat. We danced so long we eventually closed the club and had to be bounced out at 6:00am. Again we were able to hop on the metro home and made it into our beds as the sun began to rise. We had to be a bit more active on Sunday than Saturday though. Sunday night the whole TEFL group had bought tickets to the HC Sparta Prague game at 5:00pm. Following the game everyone was coming over to the hotel for a group-wide potluck. I got up around 2:00, ran to the store for some additional ingredients- made my guacamole and then helped clean up and prep for our guests. The game was awesome! Sparta was playing the 3rd place team and the both were highly skilled. It ended up going into overtime and then through 3-rounds of shoot-outs. Unfortunately Sparta ended up losing in the shoot-out, but it was still an awesome game. After the fun of the weekend it was time to get down to business come Monday. Lessons to plan, grammar to study for and jobs to begin finding. The early part of the week was spent working and enjoying our final “family” dinners at the hotel. Particularly memorable was the batch of fried dough Tamara made on Wednesday- so greasy and so good! Thursday brought final grammar presentations, the grammar exam and then my final teaching section. I had an elementary group (their English is extremely basic) and was a bit worried about the listening lesson on health and healthy lifestyle. The video they had to watch talked about things like ayurvedic medicine, but everyone seemed to comprehend the material and my concept checking went really well. I finished the lesson by asking about the what type of people were healthy. I thought I’d get answers like “athletes”, “runners”, “vegetarians” etc…but they took it to mean nationalities. Most agreed that Czechs were pretty healthy as were those living on the Mediterranean. When I asked about unhealthy people they didn’t have much to say so I suggested “Americans?” That got a big laugh and lots of nods! It was a relief to successfully finish up my last lesson, but now I’m in the process of job searching…hopefully something will come up soon! After the my final lesson (and confirming that I’d successfully passed the course) I headed home to get ready for dinner out on the town. All 20 of us headed out to find some traditional Czech food and beer. We took a few wrong turns in our search for food, but eventually found a delicious spot not too far from Old Town Square. I had my final plate of goulash (can never get enough!) and enjoyed trying some of the other dishes as well! After dinner most of us headed to Cheapu Rouge for more drinks and some dancing. Since half of the class had already completed the program a number of us went out sightseeing and souvenir shopping on Friday. It was sunny out, but freezing! After taking in the sights for a few hours we headed back home to get ready for the evening’s graduation/champagne toast. We met at the school at 6:30 and it essentially turned into one big party. Everyone passed the course so we were in fantastic moods and ready to party with everyone one last time. After hanging out at the school for about 2 hours we headed downtown where we all got down at Dejavu. Some of the staff and teachers went with us and we even met up with some of the former TEFL Prague graduates- it was a great night. The next day was my last in Prague and I decided I want to do my last bit of sightseeing solo. I went back up to Pohorelec (old stomping grounds) and tried to find my favorite little chocolate covered banana chips (couldn’t find them, but got some chocolate/cinnamon covered almonds that might even be better!). After my search for candy I meandered down to the castle and then back down and into the city. I was only out for about 3 hours, but it was so cold I felt like it was longer! That night we did games and drinks up at the Villa and then went out to Nebe for a last hurrah! Most of our number was still around so I got to say most of my good-byes. Even though we’d only known each other for 4 weeks we spent almost every waking minute together during that time and I got to know a lot of people really, really well. I was sad to leave, but know that we’ll keep in touch and will now have 20 wonderful places around the world to visit! I’ve mentioned it here before, but Berlin has great outdoor markets everyday where purveyors set up shop in one of the city’s many large squares (Platz auf Deutsch) and sell everything from fresh produce to fine china and silver. I though that maybe it was something that would only last while the weather was nice… well the opposite has proved true. Now that the cool temperatures have moved into the city, the markets have gotten bigger, with even more booths selling even stranger things. I went to our local market here in Stieglitz to browse around and also because I need a keychain fur meine Schlusseln. The best time to go to one of these markets is early on a Saturday… that is when the most shops are set up and the Berliners haven’t had time yet to pick through all the good stuff. In all honesty, the real reason I like going to these markets isn’t actually to shop. That’s just an excuse I use so I can go and sample the delicious food that is always for sale. All of it smells so good and tastes even better. The only problem is that I like the Roast Bratwurst so much, I am now hesitant to try anything new! Now that winter has arrived, they have also started selling Glühwein, which is a delicious warm spiced German wine. On a cold day, a hot glass of Gluhwein and a bratwurst at the market? Um, yeah. Anyways, after a quick stop to sample the local fare, I started to wander around the market. It was packed as usual and curiously, one of the places that was the most busy was a store selling giant stuffed animals, which to me are the most useless things in the world. Apparently the Germans disagree. Next I noticed a man selling video game systems. He had an old Sega Genesis, a PlayStation 2, a few PS3s that were in there original packaging and a Nintendo GameCube. I used to love playing GameCube back home so I decided to find out how much he was selling that for. I noticed that there were no games or conrollers displayed with it though. I asked him how much for the GameCube: “200 euros.” Well where are the controllers, I asked. “Don’t have any.” Games? “Don’t have any.” What an outrageous price for a game system that is essentially useless to the buyer! I am thinking of having my Mom send over my old GameCube so I can make a few bucks if that is the going rate. From there I moved on to a children’s shop that was selling various books, toys and other items. Kids books are the best way to learn German, so I thought I would take a look at what they had to offer. I immeadiately was drawn to a Scrooge McDuck German comic book. I started flippping through the pages and was suprised at how simple most of the German was. I figured it would be pretty cheap so I decided to ask. Well that turned out to be a mistake… apparently, my best German accent makes people think that I know German, so the man launched into a long speech, of which I understood maybe 2% of the words. I didn’t know what to do, so I just stood there nodding, which I think gave him the impression that I understood what he was saying, so he continued on for a good 2 minutes. I have no idea what he was saying and frankly I can’t imagine what someone could be saying at such length about the price of a used Obi-Wan keychain. When he finally finished, I nodded at him one more time, furrowed my brow, than thanked him and put down the book and keychain and walked away empty handed. In addition to our 2-4 lessons a day we each teach twice a week. One group teaches Wed/Fri. and the other Tues./Thurs. The first two weeks I was in the Wed/Fri group, but I’ve switched to the Tues./Thurs. section for the final two weeks. Thus far I’ve taught Elementary, Intermediate and Upper-Intermediate classes. Every class has been unique and rewarding, but I think the upper-intermediate group has been my favorite. In addition to the rotation of groups, we also get the opportunity to plan and execute a variety of different lessons. I’ve taught reading, listening, speaking, writing and grammar. I enjoy the reading and speaking activities the most and absolutely abhor the grammar sections. I do have to admit though that my grammar has improved a bit and the lessons we’ve had on it weren’t as bad as I anticipated. I’ve found that as long as you have some context with your grammar it tends to go over easier, i.e. a story students can pull examples out of or a video clip that shows a specific tense or form. Next Thursday we have our big final exam/grammar test so I’ll be spending a good deal of time this next week learning even more about things like past perfect, 3rd conditional and future perfect simple…sounds exhilarating doesn’t it! Teaching has been much more challenging, but much more rewarding than I ever imagined. I still can’t imagine a job that I’d love more than the job I had at Northeastern (I still miss it terribly! ), but I think teaching will be an invaluable way to see education from a new perspective. I’ve been on the administration side of schools for the past four years and am curious about the faculty perspective. I’ve started to search for jobs in Berlin, but haven’t had any luck yet. I’m hoping to send out many more resumes this weekend and hopefully I’ll get a bite soon. I’m going to try and not worry too much though, but rather enjoy the rest of my time here in Prague with my lovely classmates and teachers! Weekend here we come! Dave came to visit this weekend and I was SO happy to see him! Two weeks is a long time to be apart and it was so good to be together again. He got in on Friday evening and we started the night off right away- drinks with everyone from the Hotel! After a few ice cold pivos and some shots of a traditional Czech liquor, Vaječný Sen (translation: Egg Dream) we headed up to meet the rest of group downtown. We ended up spending most of the night at a club in Wenceslas Square, sharing some beers and Absinth shots. The rest of the group headed to another club around 1:30am, but Dave and I headed home so we could get enough rest for a full day of fun on Saturday. True to plan we woke up early on Saturday ready to get in some sightseeing. Of course- we had to stop by Bohemia Bagel for a post night of drinking breakfast (delicious as always!). After breakfast we walked through Old Town Square, checked out a cute street market and then jumped on the 22 tram up to Pohořelec. I wanted to look into to visiting Strahov Monastery, but it was closed for lunch break. Rather than waiting around we decided to venture up Petrin Hill and visit the observation tower. Basically we did the reverse of what Maddie and I did last week. Last week we walked up the hill and then took the tram back down. Dave and I opted for the easy ride up and a stroll down (much more my style). After our lovely and lengthy stroll we headed into the city of Prague to check out some of the biggest tourist attractions. Since we’ve both been to the city before we were able to be a bit more relaxed about our touristing (but I still managed to get in some good photo ops! We stopped on a park bench for 45 minutes or so, soaking up the sun and watching locals enjoy the afternoon. We made a slight detour to the Lennon Wall, walked over the Charles Bridge, back into Old Town Square and then made our way home. We saw a lot, including something I hadn’t seen before- the Love Lock gate. Legend has it that when you find your true love you carve your names on a lock and lock it onto the gate. You then throw the key in to the canal, “locking” your love forever! We overheard a tour guide telling her group that the locks started appearing in 2009 and have grown in popularity since. I thought it was a romantic and touching site. Dave and I didn’t have a lock on us, but I found one lock in the shape of a heart with the words, “For lovers only” and decided it could be our symbolic lock. Maybe one day we’ll go back and add our lock to the masses! After a long morning of walking and taking in the sites we came back to the hotel for an afternoon nap. Instead of napping I found out that South Park Studios (the official website will full length South Park episodes) plays full episodes in Europe! So of course I had to catch up on the new season…For those of you who haven’t traveled internationally- most free streaming sites, like Hulu, NBC, ABC etc…don’t work in Europe. So finally finding a way to watch high quality episodes of my favorite shows was a fantastic find! We didn’t have much time though because we were meeting up with about 10 people from our group for an evening soccer game (or “football match”) between AC Sparta Prague and Mlada Boleslav. The game was a lot of fun, though Sparta was suppose to win and got their asses kicked! We got half litre beers and sausages for 75 korunas (a little less than $4 American) and noticed that it cost 80 korunas for the soda and sausage deal. Man I love being in a country that takes their beer seriously! The game ended around 8:30 and Dave and I departed from the rest of the group for a late dinner. We stopped in at a fantastic and traditional Czech restaurant a little outside of Old Town Square. I got goulash (my 5th plate in two weeks?!) and Dave ordered something called the Peasant Plate, which was essentially a pig knuckle, i.e. a giant pig knee. I was a little nervous to try it, but it was pretty delicious. I love my adventurous carnivorous man- always getting me to try new things! We wanted our final day together in Prague to also be low key. Since we both love zoos- when we lived in D.C. we lived only a 15 minute walk to the National Zoo and walked through about once a week- we decided to check out the Prague Zoo. We’d heard good things about the recent renovations and were not disappointed! The zoo is huge, well priced and beautiful. We spent more than 3 hours wandering around, checking out animals and enjoying the beautiful Fall day. My favorite animals were, of course, the elephants. Dave was excited to see the moose (a Maine thing I guess), but unfortunately they weren’t out. Luckily he was greatly impressed by the polar bears and claimed they made up for missing the moose. We also both loved the seals, mountain goats, gorillas and birds of prey. In the birds of prey area they have a spot for visitors to view the animals with no net or fence. Because they’re birds of prey there was some pretty rank smelling rotten meat carcasses lying around their pen, but they were fascinating to watch. The only part of the zoo I didn’t like was the free roaming bat section. You walk into this spooky, dark cave (for nocturnal animals) and in one section bats are able to fly freely around your head. Needless to say I was not impressed and made a beeline for the exit. Dave thought it was pretty funny, but we’ve had two experiences in the past year with bats in our room/house and I’d be happy to never see another one again! After the zoo we ate a hearty Czech lunch consisting of many beers and some fried cheese. Later that night we went out with a few people to catch the Patriots v. Steelers game at an “American style bar”. This place was more like the basement of a dirty frat house, but it did have the game. Though the end result was less than ideal (the Pats lost), it was still a lot of fun to get our “real football” fix. We got back pretty late, but because Day Light Saving Time took place across the EU this weekend the game ended an hour earlier than usual- just for this week though! Overall it was a wonderful weekend and it was so good to be together again. Dave left early yesterday morning and by time I woke up I already missed him. Only two more weeks until we’re reunited forever! Good thing we’re both loving our programs and are super busy- the next two weeks are going to fly by!